« Gloves… and a Kitty! 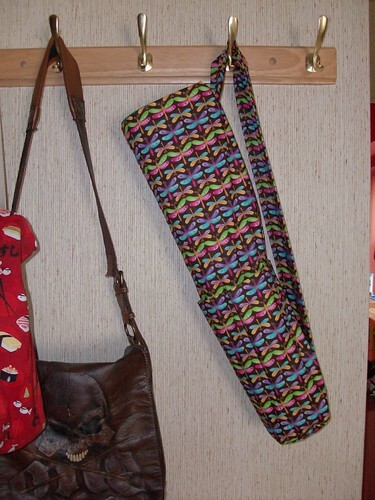 The pattern is Amy Butler’s free Nigella Yoga Bag pattern – very easy to follow, and turned out really cute. It’s lined in a bright green polka-dot print. An Amy Butler Frenchy Bag (the handbag size – the pattern also has a shoulder bag size). 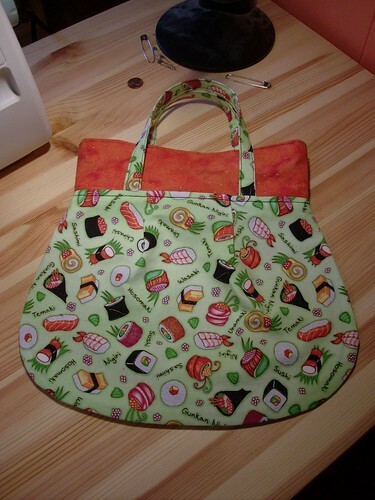 The pattern was a gift from my blogless friend Mindy, and the sushi print fabric was a gift from Amanda, so this bag makes me smile on many levels. Thanks girls! Oh, and Maryanne and I will be making a trip up to Fabric Chest in Glen Burnie on Wednesday. If all goes well, I might have my birthday present when we get back. 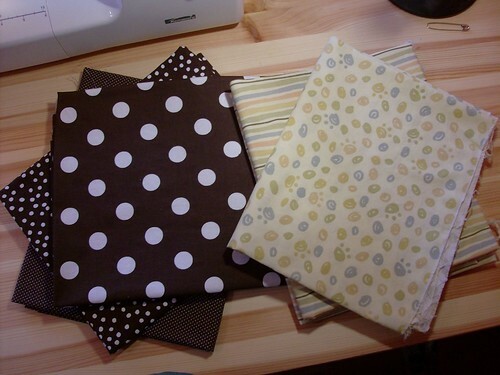 September 15th, 2008 | Tags: FOs, Planned Projects, Sewing | Category: Misc. Too cute! I guess I need a yoga mat bag too, huh? I’d better get to work! OMG!! You are on a roll!! 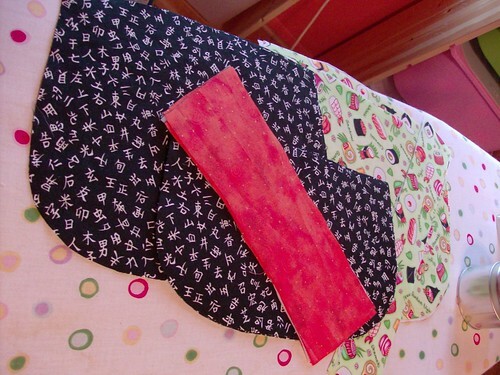 Love it all and each sewing posts brings me one step closer to pulling out the machine!! So cute!!! you are totally making me hanker for my sewing machine! very lovely bags. Oh, cute Frenchy bag! I have one, too. My mummy made it for me. That’s a cute bag. Lord I wish we had a decent fabric store nearby! Wow. You sure are on a roll. Can’t wait to see what becomes of the polka dot fabric. I was just looking at them today as well as the dragonfly fabric. Love your AB bag. Love the yoga bag and the Frenchy one too! Hehe..um better make room for this fiber stash!